These moves from your favorite fitness class might help heal your most frustrating body problems. Aching back? Menstrual cramps? Next time you're hurting, grab a yoga mat. That's right your favorite fitness class might also help heal you. Often treated with over-the-counter painkillers and birth control pills, monthly menstrual cramps are a real bummer. 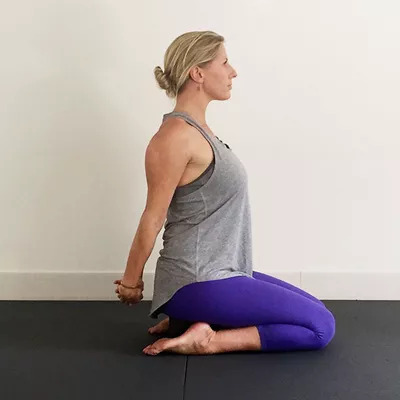 Performing these poses at the height of your pain may be helpful. Fact: we all spend entirely too much time hunched over our phones and computers. Research shows looking down at your screen may put as much as 60 pounds of added weight to your spine. This poor posture over time can lead to killer back pain. See: text neck. Start by lying on the ground with your knees bent and feet planted firmly on the ground. Then, raise your hips up straight to the sky, holding the stretch. 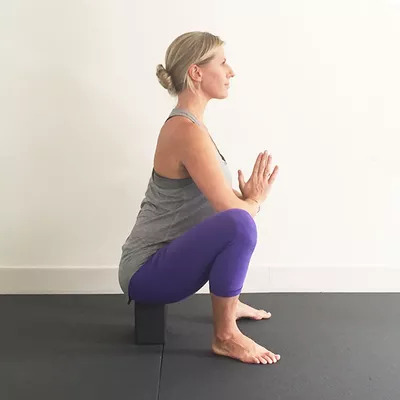 For a modification, you can place a block under your lower back for stabilization. When a big meal leads to gas and an upset tummy, a few minutes of yoga may be just what you need. 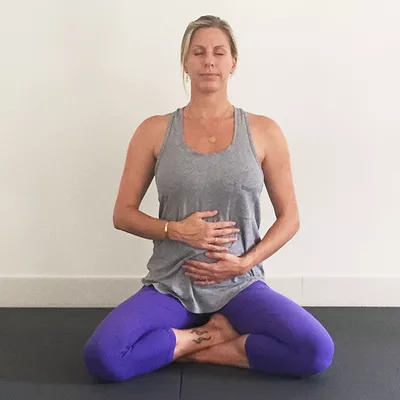 Brauer says that many of the yoga poses that work to ease menstrual cramps may also help bloating. “Focus on movements that will activate or stimulate the digestive system,” she says. Sit up straight or lay down with your hands placed over your diaphragm. Breath deeply, through your belly, so that your abdomen expands and contracts (as opposed to your chest). How it helps: This form of breathing through the abdomen helps stretch our your digestive muscles and organs. Also known as tinnitus, chronic ringing ears affects approximately 40 million Americans. Treatment often involves medications to help patients to control anxiety, depression, or insomnia. This is because stress can actually increase symptoms of tinnitus, which is why yoga, a known stress reliever might help, too. Breathe in and out through your nose. When inhaling, relax the abdomen, allowing it to expand with your breath rising through the belly, ribs and chest. Exhale from top to bottom. How it helps: This breathing exercise is so relaxing, you just might melt. Start in standing position with your legs stepped wide apart. Turn your right foot out 90 degrees, keeping your left foot facing forward. 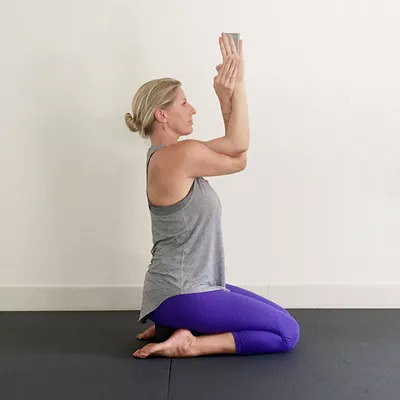 Lift both arms straight, parallel to the floor, and then reach your right hand down your right foot and left arm straight into the air, bending at the waist. To release, straighten your upper body back up and repeat on the opposite side. How it helps: Triangle pose opens your whole body, allowing you to focus on stretching outward and letting go. Lie on your back and take both legs up to sky. Bend both knees and bring them toward your body, down to your head to muffle your ears. Because this is an advanced move, beginners can use a modification. Put a yoga block under your hips and lying on your back, stretch your legs up a wall. Then take both hands and cover both ears. 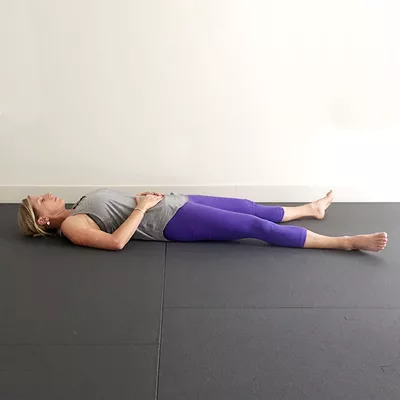 How it helps: This move works to create a gentle suction on your ears as you relax your body and focus on your breathing to eliminate stress.